Leaking gutters are not just an irritation, the problems caused by water ingress, which might not easily be noticed can lead to costly building repairs. Halifax Seamless Gutters offer a full survey, giving advise on the best system which would suit each individual property. We can work out what size gutter and downpipes are required for the roof area and location of your property. Due to high cost of scaffolding, Halifax Seamless offers a full range of access equipment, thus helping to keep customers within their budget when replacing their guttering. For customers who wish to have new plastic guttering installed on their home we can offer a range of styles and colours. 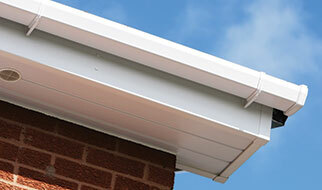 We only supply high quality plastic guttering and roofline products and are available in a many colour options. For traditional properties or properties within a Heritage area we can supply and install traditional wood guttering, these are usually installed in lengths up to 6 meters and can be cut to suite any building size and shape. We only install high quality treated timber guttering, before installation two coats of bitumen paint is applied in advance at our workshop. For properties wanting a traditional timber guttering but with less maintenance then Twinplas guttering would be an ideal option. Twinplas® gutter profile is a rainwater system which has been designed to replace old-fashioned timber guttering or for new applications requiring a more traditional appearance. The product weighs less than 3kg per metre and is available with unique sleeve connectors which simply slide over the gutter profile. Also available are integrated down pipe fittings, internal and external mitre joints. Twinplas® is the perfect choice for replacement guttering in the public sector, terraced housing, barn conversions and commercial applications. Finlock guttering are pre cast concrete lengths which are lined with bitumen, they are supported on the external walls of the property. When the bitumen fails these tend to leak down the joints and in to the cavity of the property causing damp inside. These gutters can either be cut off or relined. Re-lining is the most cost effective and less intrusive option. We are an approved contractor for the installation of Plygene Gutterline. Gutterline stops concrete gutters leaking, for good. For the first time ever, instead of resorting to temporary repairs using mastics, or coping with the horrendous disruption and cost of replacing these built-in gutters, Plygene Gutterline® provides an effective, economic and permanent solution. Whether you’re looking for fascia boards, soffits, cladding or barge-boards, our range of products are made from high quality materials guaranteed to last. This gives you complete reassurance that it will last for years to come without rotting, fading or peeling. We will remove the old fascia, soffits and gutters and install a revolutionary Roof-guard system in addition to high quality PVC-u Fascia, Soffits and Seamless Aluminium Guttering. When choosing us to replace your fascia boards, soffits and guttering, you are dealing with an established company with over 10 years experience in the roof-line and roofing industry. We use our own scaffolding systems and are able to bridge conservatories and bay windows with minimal fuss. All our UPVC fascia boards are manufactured by Eurocell. That means that all the colours offered across our entire roofing accessories range match perfectly. And we have 8 different colours and finishes to choose from. All our whites are the same, all our woodgrain finishes match perfectly. Better still, we offer up to 20 years’ guarantee against cracking and warping. Our fascia boards ARE made from 18mm thick high quality UPVC. That means they are strong and weather-proof, the ideal long-term protection for your roof.